The purpose of this experiment was to determine the effect of front and back designs on the aerodynamic drag of a vehicle. I became interested in this idea because I loved cars, specifically fast cars. I knew that certain designs were more aerodynamic than others, and that less drag would allow for more speed. The information gained from this experiment could help car designers choose what shape to base the design of a vehicle on. A car with less drag could be faster and also more fuel-efficient. My first hypothesis was that a square front and back design would be the least aerodynamic, and would create the most drag. My second hypothesis was that a hemispherical front and a conical back design would be the most aerodynamic, and would create the least amount of drag. The manipulated variable was the design of each of the cars. The responding variable was the amount of drag created. To measure the responding variable, I used a lightweight spring scale. 5) Switch the design in the car base with one of the other designs. 6) Repeat steps 3 and 4 until all 5 designs have been tested 5 times. 7) Average the results for each design. 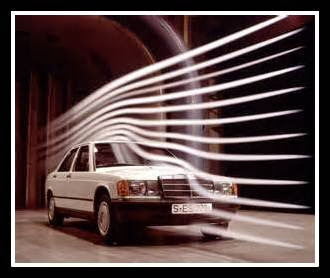 The original purpose of this experiment was to determine the effect of frontal, back, and windshield designs on the aerodynamic drag of a vehicle. The results of the experiment were that Car Design 1 produced an average of 0.078 newtons of drag, Car Design 2 produced an average of 0.0515 newtons of drag, Car Design 3 produced an average of 0.0797 newtons of drag, Car Design 4 produced an average of 0.0701 newtons of drag, and Car Design 5 produced an average of 0.0342 newtons of drag. My first hypothesis was that a square front and back design (Design 2) would be the least aerodynamic, and would create the most drag. My second hypothesis was that a hemispherical front and a hemispherical (Design 3) back design would be the most aerodynamic, and would create the least amount of drag. The results indicate that my first hypothesis should be rejected, because Design 3 (hemispherical convex front, with hemispherical concave back) created the most drag. The results indicate that hypothesis 2 should be rejected, because Design 1 (triangular front, flat back) created the least amount of drag. After thinking about the results of this experiment, I wonder if I made more designs with more detail, would it affect the results? If I were to conduct this project again I would use wood for my designs instead of Styrofoam to (hopefully) get better results.